I have an issue with the very idea of decaffeinated coffee. As with alcohol-free beer and sugar-free Coke, it rather seems to miss the very essence of the drink. Yes, I like the taste of coffee but I’m rather keen on (or, if you’re more cynical, addicted to) the caffeine in it too. However, it’s always more about taste than content. I avoid sugar-free fizzy drinks because I find that all artificial sweeteners have a ghastly aftertaste and/or leave my tongue feeling furry. I avoid alcohol-free beer because, by and large, they’re overly sweet with a peculiar raw-malt flavour to them – if anyone knows any decent ones, though, please let me know! And decaffeinated coffee has always been pretty grim too; weak, bitter and generally tasting of last night’s coffee pot dregs. Partly, this is a result of the decaffeination process. Traditional industrial methods involve soaking the beans in various organic solvents for several hours, in a bid to extract the caffeine but preserve all the other flavour components. Given that coffee has over 400 different flavour components to it, trying to extract just one this way would seem to be doomed to failure. However, I suspect the main reason for this is that the decaffeination process is long and expensive, so producers have tended to use cheaper beans to start with; a decision that is never going to result in good coffee. There’s also an irony in this approach, as the cheaper Robusta beans actually start out with more caffeine than the pricier Arabica beans so not only do they end up with an inferior coffee, but they also have extract more caffeine to do so! 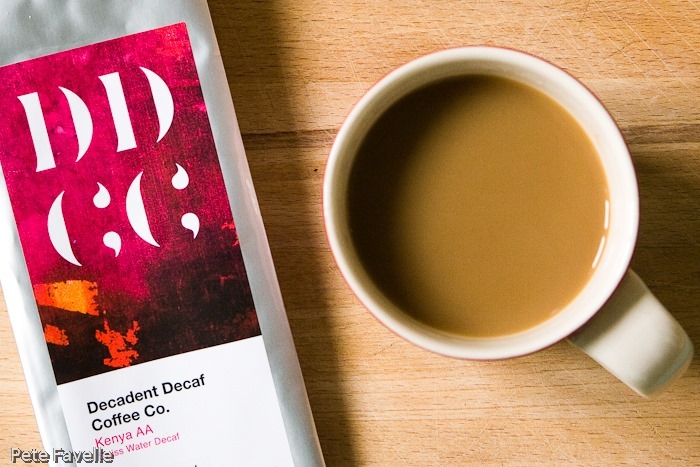 The Decadent Decaf Coffee Co is taking a refreshingly different approach. They use a water-based process to extract the caffeine – the Swiss Water Process which, as the name suggests, was developed in Switzerland in the 1980s. This avoids the need for chemical solvents (although the failed A-level chemist in me is obliged to point out that water is, in fact, a rather good solvent), and claims to preserve the full character of the coffee. Far more importantly, they use quality beans, covering many of the usual origins – Kenya, Ethiopia, Costa Rica and Indonesia. This is their Kenya AA, a medium-roasted, medium strength coffee. The grounds have quite a delicate aroma; sharp redcurrant fruit and soft brown sugar with just a hint of old, aged wood lurking underneath. Brewed, the aromas are similar – a gentle acidic fruit balanced with a brown sugar sweetness. In the mouth, it’s mild; sweet with a light fruitiness to it. The finish has a nice tannic dryness to it, which helps to make this a refreshing, easy drinking coffee. Overall it’s pretty decent; 3 stars. It’s a little on the weak side for my tastes, but no worse than any other medium roasted Kenyan coffee. Certainly the lack of caffeine doesn’t show at all, and as someone who probably drinks more caffeinated coffee than is healthy, I shall definitely have to try some of their stronger roasts. Many thanks to the Decadent Decaffeinated Coffee Co for this sample.